One of the great advantages of my job is that I never know where I may be sent to work next. To some this may create feelings of anxiety though to me, it delivers a genuine sense of adventure. It is not as though all the places I get sent are conventionally beautiful or picturesque either. It doesn’t really matter to me, I just enjoy the difference. So my interest was certainly piqued when I received a call from one of my clients and they asked if I would be keen to paint two view of the Norfolk coast. It sounded like a lovely piece and I have never visited Norfolk before so I agreed on the spot. A few weeks later, I booked a place in Blakeney just up the coast then packed all my painting gear along with my trusty carpet slippers (you can only ‘adventure’ so far) and headed to Norfolk. Subsequently my knowledge of Norfolk was pretty limited too. To me Norfolk summed up, The Fens, Viking invasions and Alan Partridge. A bit embarrassing really. The client explained that she and her family spent many happy weeks sailing around the tidal marshes of Morston on the north coast of the county and that they would like a few memories of those times. I chose Blakeney because it is a mite busier than Morston with a few more pubs and restaurants too. It is a small fishing village which began as a small medieval fishing port until the river silted up too much for the larger boats to get in and out. Today, thankfully, it seems to thrive on the tourist trade. It was pretty late in the season although the quayside was full of visitors making the most of the last of the warmth. There are plenty of galleries too so I guess it is a fairly popular spot for artists as well. A few miles down the coast is Morston. As I say, it is much smaller than Blakeney and has a population of less than a hundred, though its remoteness adds to its beauty. The name or Morston or ‘Merstona’ was first noted in The Doomsday book in 1086. It means ‘Marsh town’ which is pretty accurate really as you look out toward the North Sea there are miles of marshland threaded with small tidal channels which fill and empty twice a day, an ever moving landscape. I hooked up with the client in the early afternoon to discuss the paintings. I really enjoy this part as I get the opportunity to explore the client’s experience of the place so I can place it into my work. 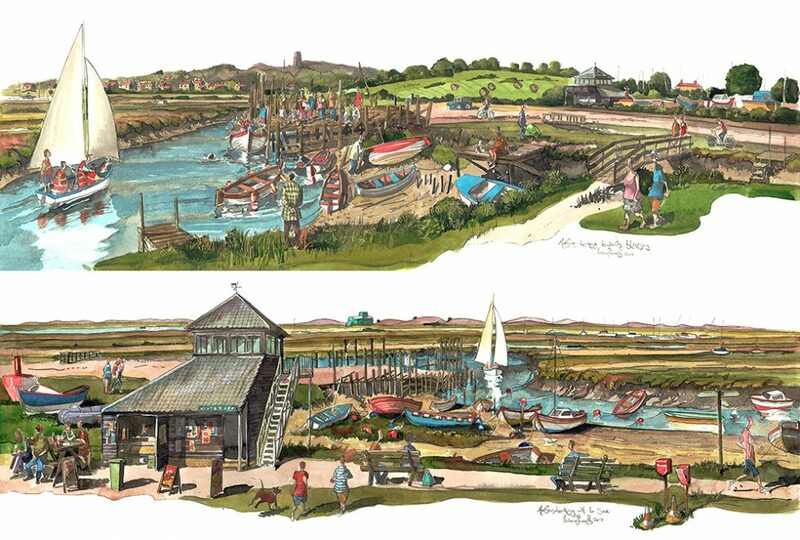 A limited Edition print of this scene in Morston is available to buy here. We felt the first view was to be from the marshes looking towards Blakeney beyond. In front of us, we can see the jetties where tourists climb aboard the boat which takes them out to view the seals. Where we were standing is below the water at high tide which I’m not fond of. If you have read a few of my other posts you know that I have a bit of a phobia of being cut off by a tide. It is not totally mad as sometimes when I’m working on the beach I can be concentrating so much that I simply don’t notice the tide coming in around me. I got my feet wet in St Ives once because I didn’t look behind me enough. Anyway, the client was confident and kept an eye out while I worked up a few visuals and ideas. After adding the family boat, we felt we had enough of an idea to work up a final printing. The second idea was firmly on dry land much to my relief. This was looking out towards Blakeney Point which has an old lifeboat station that is now a visitors centre. In front, there is a National Trust observation tower for bird and wildlife watchers. A few visitors were gathered around the towers cafe. It made for a relaxing afternoon’s work. I especially enjoyed placing in the tilting boats at low tide, all thrown at awkward angles by the sea’s action. Some were recently painted, others looked as though they had sunk a few times and were filthy and all the better for it. Boats are tricky to draw but well worth it. Once we had all the ideas down, the client left me to tidy things up. These would be essentially studio paintings though there is nothing like getting on site with a client to get the initial ideas cleared away. Once I was happy, I had enough time to drive down to Cromer to have a look about and dive into a big bag of fish and chips. The pier in Cromer is at the bottom of a modest cliff. 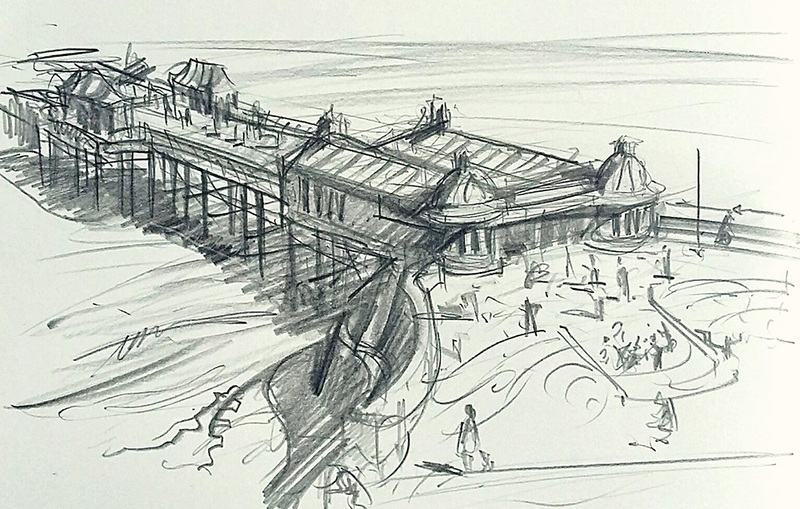 I did a quick drawing from above though the folks on the pier were too far off to give me any sort of buzz. I purchased my fish and chips then lumped onto the beach to eat. 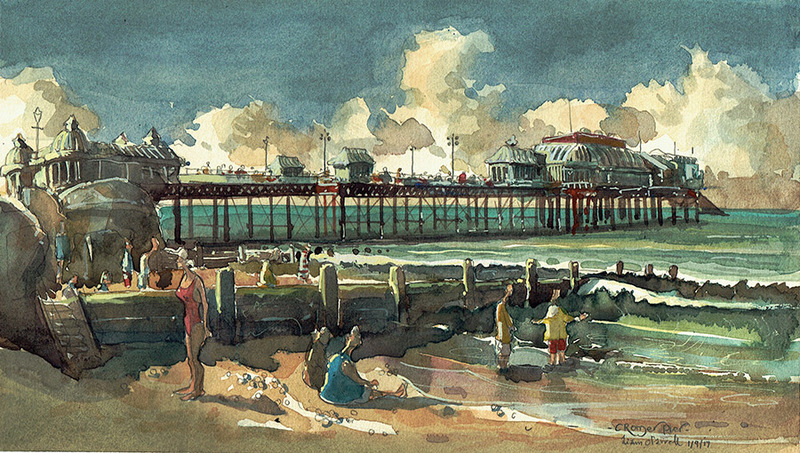 Once full, I tossed the remains to the beefy seagulls, and did a quick watercolour of the pier. It was a fine afternoon with bright pink tourists dotted all over the place. They had fish and chips too. I painted them all. I was rather pleased with this spontaneous watercolour and I think I will work it up to an oil painting. These are all really beautiful paintings and I loved hearing the story behind them! Your comments about the tide made me chuckle – I wonder how many artists get their feet wet accidentally while painting! Yes i feel so stupid about the tide coming in. I’m always snatching my head around when i drift off painting. Fingers crossed i won’t get swept away one day.